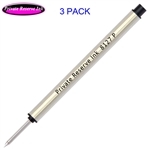 Private Reserve Schmidt P8127 Capless Rollerball refill medium tip. Short roller ball refill by Schmidt . Schmidt Capless System is newly developed for the most smooth and elegant writing. This system combines the individual writing character of a fountain pen with the problem-free handling comfort of a ball pen. · Metal tube with tampon system, stainless steel tip with 0.7 mm ruby ball. · Private Reserve P8127 black ink medium tip short capless rollerball Refill. · Private Reserve P8127 blue ink medium tip short capless rollerball Refill. Lanier Pens is your source for all Private Reserve Pen refills including the popular Private Reserve P8127 Capless Rollerball Refill.